Fort Bridger was the first post built in the American West specifically to cater to travelers. During its functional years, the fort had three owners: Jim Bridger and Louis Vasquez from 1842 to 1855; the Mormon Church from 1855 to 1857; and the federal government from 1857 to 1890. 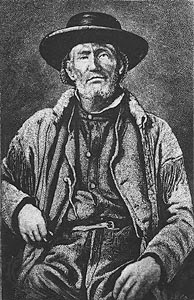 Jim Bridger, one of the original founders of the outpost, was famous as a mountain man. He was called “the Daniel Boone of the Rockies,” and was perhaps the first white man to see Great Salt Lake. His name has lived on in association with the fort and Bridger Pass, which he discovered. There is also a town now called Fort Bridger, at the site of the old outpost. Many stories are told about Jim Bridger, some of which have been documented. For example, in a skirmish with Indians in 1832, he was shot in the back with an arrow. The head remained in his body until it was extracted three years later by missionary Marcus Whitman. By 1840, the mountain men could see that the era of fur trapping was coming to an end. This would not be a way of making a living for them much longer. But people were starting to move west. Bridger saw that as an opportunity and began talking to other men about establishing trading posts. Fort Bridger actually had four incarnations, all in the same area. The first was built in 1841 by Bridger and Henry Fraeb, on the Green River, between the mouths of the Big Sandy and the Black Fork. Fraeb was killed by Indians before the buildings were completed, which may have prompted Bridger to abandon the site. The second Fort Bridger was built farther southwest on the Green River, still near the site of the fur trappers’ rendezvous held annually from 1825 to 1840. In 1842, Jim Bridger and Louis Vasquez set out from St. Louis to establish the new Fort Bridger, in what is now southwestern Wyoming. Vasquez had been in the Rockies as long as Bridger, and was from a distinguished Mexican family and well educated. Their intent was to trade with Americans moving west as well as with the Indians. They positioned the post on a bluff overlooking the Black’s Fork. However, the next spring they moved it down to the river bottoms. This third site of Fort Bridger is the most famous one. This fort was the first one established west of the Mississippi River for the main purpose of trading with emigrants, rather than engaging mostly in the fur trade. It was located on the trail that the emigrants were most likely to use at that time. Pioneers on wagon trains using the Oregon, California, and Mormon Trails stopped here. It’s also the same fort that was later bought by the Mormons and burned by them when they abandoned it in 1857. At this point, the Black’s Fork divided into several smaller streams that watered the surrounding valley. People on wagon trains who had spent all summer trudging across the dusty plains took joy when they saw this green haven, with plenty of grazing for their livestock and willow trees to give them shade. Bridger and Vasquez provided replacement livestock for travelers whose horses and oxen were worn out. They also built a blacksmith shop on the site. 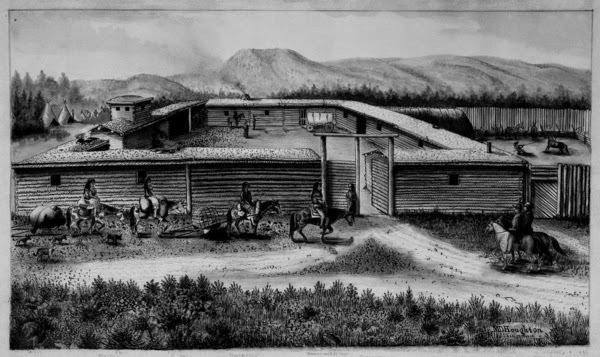 While the location of Fort Bridger seemed ideal, the buildings were described by visitors as “shabby.” Constructed of logs or sticks, the “fort” had a roof of brush covered by earth. A village of Indian lodges sprang up near it, many of the lodges occupied by trappers with Indian wives. Bridger and Vasquez stocked staples brought in overland—coffee, sugar, flour, pork, soap, blankets, knives, ready-made clothing and hats, lead, and gunpowder, as well as doing a brisk business in tanned hides, buffalo robes, moccasins, and other items which they took in trade from the Indians. Business at the fort slacked off when a new wagon route was formed, a shortcut that saved several days of travel for those going to Oregon and Idaho. It was known as the Greenwood Cutoff, or later the Sublette Cutoff. Within a year, however, Lanford Hastings discovered a new route that made travel to California easier. It began near Fort Bridger and went south of the original route. The Hastings Cutoff became very popular for those going to California and saved the business and relevance of Fort Bridger. Jim Bridger butted heads with the Mormon settlers. In 1853, the Mormon militia tried to arrest him for selling alcohol and firearms to Indians, which was against federal law. Bridger escaped and stayed away for a while, during which the Mormons established a nearby outpost called Fort Supply. In 1855, they took over Fort Bridger, claiming they had paid Vasquez $8,000 for it, but Bridger denied this. Documents indicate the payment was made, half in 1855 and half later, in 1858. The deed was recorded in Salt Lake City, in 1858. The Mormons rebuilt the fort as a 100-foot-square stone structure with walls 14 feet high, a large horse corral, and a masonry wall. Hostilities erupted between federal authorities and the Mormons in 1857, and the Mormons refused to accept the new governor President James Buchanan appointed to replace Brigham Young. As the U.S. Army approached through Wyoming, the Mormons burned the fort to keep it from falling into the hands of the enemy and retreated into Utah. General Johnston’s troops wintered there. In the spring, two companies were left at Fort Bridger to establish it as an official army post. This was the fourth Fort Bridger. The rebuilt fort was used as a Pony Express station in 1860-61, and remained active as a military post until 1878, when it was abandoned for two years. It was re-established from 1880 to 1890, after which it was closed as an army post. 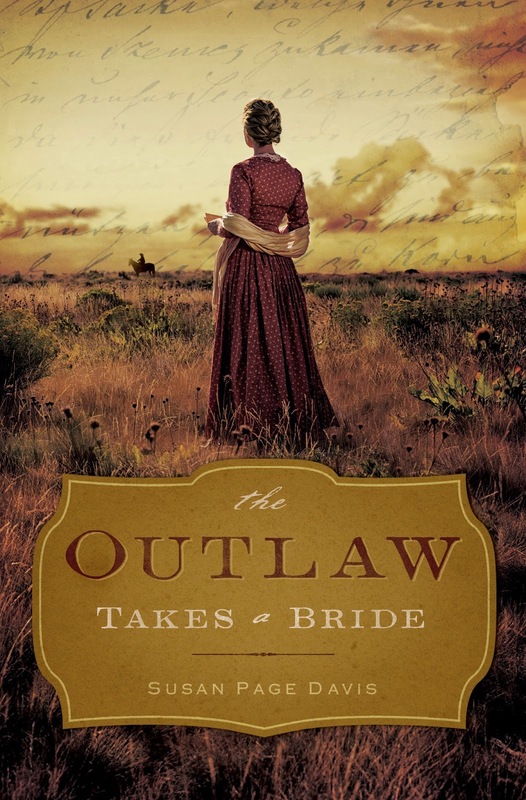 To enter a drawing for a copy of Susan Page Davis’s new book The Outlaw Takes a Bride, leave a comment below, including your contact information. That was very interesting! I love reading about this time period.....wagon trains, the forts, settlement of new frontiers, and the brave men and women who made those long treks. Thanks, Connie! I find this period fascinating too, and I admire the men and women who dared to leave the known and set out for a new life. Thank you for this fascinating look at Fort Bridger. I had heard of it big never knew the history. I knew what you meant. :) There are so many interesting places out there that I have yet to discover! I love research, and I love seeing the places where the pioneers went. Thank you, Susan, for this very interesting post. I always look forward to what you have to share with us. Fascinating, as I know your novel will be! It's been awhile since I wrote a review for one of your novels. Thank you for the chance to win! Thanks, Marianne! Always good to hear from you. I love this blog and the history you tell. I also enjoy Susan's books and would love to win this one, thank you for the chance. Wendy, thanks for your kind words. This is a great site for meeting history buffs and authors, and learning about interesting events from the past. Thank you for this post. It was very interesting. I love learning new things about history. This sounds like a great book. Thanks, Susan. I wish we could see Fort Bridger today the way it was when the wagon train travelers first saw it. Just for a few hours, though. I don't think I want to camp out there. I love to read about this time period . I got hooked in my childhood by reading the Little House on the Prarie books now historical fiction is my favorite genere. I appreciate the time you put into reserarch for your books . Very interesting article about Fort Brigner. I have heard of it but never knew it's history. Thank you for sharing it with is. I love your books and would love for a chance to read this one. Thank you. I'll tell you a secret, Deanne. I didn't find the Little House books until I was in college. That's when the TV series pilot was first aired, and all the girls at my school were saying, "WHAT? You've never heard of this?" So I had to read the whole series to catch up. Thanks so much for all the detail you found about Fort Bridger. I am fascinated by the history of these areas, since I live in the Midwest. I would love to win this book. It's amazing all the history that could be learned. I only take in a little at a time. How do you keep it all straight? For my books, I usually make a binder to keep research in. The computer helps a lot. I try to check all my facts, but occasionally something gets by me. Nobody can keep it all in their head, so I rely on books, notes, charts--lots of aids to help me.